Here’s the easy recipe you can make in your Instant Pot or other pressure cooker that’s so much more than a pressure cooker. My husband and son liked it so much they don’t ever want to eat take out shrimp fried rice again. These are just the ingredients I chose to include. Add your own choices and let us know how it turned out for you. UPDATE: Some people have found that the rice cycle was not enough time for their rice to cook. You can do one of two things. You can use the manual cycle on high pressure for 12 minutes, or you can double the rice cycle if you have problems. it wasn’t a problem for me, but I’ve had 2 people tell me that the rice cycle just wasn’t enough for them. Let me know in the comments what worked for you. Thanks! Fast and easy and much better than take out. 2 cups brown rice You can use another kind if you like. Push the saute button on the Instant Pot and let heat for a couple of minutes. Add 2 Tbsp of the sesame oil and heat. Once you hear the sesame oil bubbling, add the two beaten eggs and scramble them. Remove from pot and add another Tbs. of sesame oil. Add the chopped onion and minced garlic and saute until translucent. shut off the saute feature and add shrimp and peas and carrots. Add soy sauce, ginger, salt and peppers to the water and pour over all. Give the ingredients a healthy stir and place the cover on the Instant Pot. Push the rice button, set the valve to pressure and wait for the results. Once you've opened the pressure cooker, give the ingredients another little stir and let sit about 5 minutes. Serve with eggrolls or Asian salad. After the shrimp fried rice is cooked, you can let the pot depressurize itself (10-15 minutes) or you can release the pressure by pushing the knob to release. I like to let it depressurize to let that rice settle a little, but both methods work. Making this now, can’t wait. When do you add the scrambled eggs back in? Guessing after cooking is complete, just stir them in before serving, right? I swirled them back in just before the cycle. Hope you really enjoy the recipe! Hi, I just started the pressure cooking and saw no instructions for the eggs that were scrambled earlier. I am afraid I didn’t understand your reply to the commenter above who wondered too. Can you be a bit more specific? Sorry I am on my first day after an appendectomy and find I need everything spelled out or it gets lost in a haze. Thanks. I folded them in right before switching to the pressure cooking setting. So I scrambled them on saute setting, took them out, then put in the rest of the ingredients, put the eggs on top and then mixed it all together. Not too much mixing, just enough to swirl everything together. Then I set it to the rice setting and waited. Just as a reminder, some, when using brown rice have had to send it through the rice setting twice for more tender rice. Hope this works out for you! Love shrimp fried rice. Bought some frozen raw shrimp. Did not see designation of raw or cooked shrimp to add to IP! Which one? I used precooked shrimp, but I think the time is long enough to use raw shrimp. Let me know how it turns out! Made 2 batches, both came out soupy! Completely dissatisfied and disappointed! So sorry to hear that. Did you use instant rice or regular rice? It really does make a difference. I see you said you use cooked shrimp. I’m surprised that it doesn’t overcook in the IP! I read that even frozen raw shrimp only takes 2-3 minutes. How long does this cook for on the rice setting? For regular rice 12 minutes. For brown rice 20 minutes. I suppose you could add them at the end and just steam it, but I like the way the flavor goes into the rice while cooking. So weird. I don’t know what else to say except maybe reduce the amount of water. You do need to let it sit for a couple of minutes before eating. I’ve never had an issue, so not sure how to fix it. I used short grain brown rice… Not instant… Had to cook it on high pressure for 3 cycles of 12 minutes with a quick release. I am cooking at only 500 ft altitude… I am amazed your rice is done with one cycle and your shrimp are big rubber balls… I added mine afterward. I wonder why outcomes seem so different. Was your rice mushy? Let me know and I’ll revamp the recipe to reflect the changes. Seems like everyone has had a different result. My results have been consistent, but I’ll work on an alternative recipe to see if changes need to be made. Thanks for all the feedback. Sorry to say, I tried this tonight. 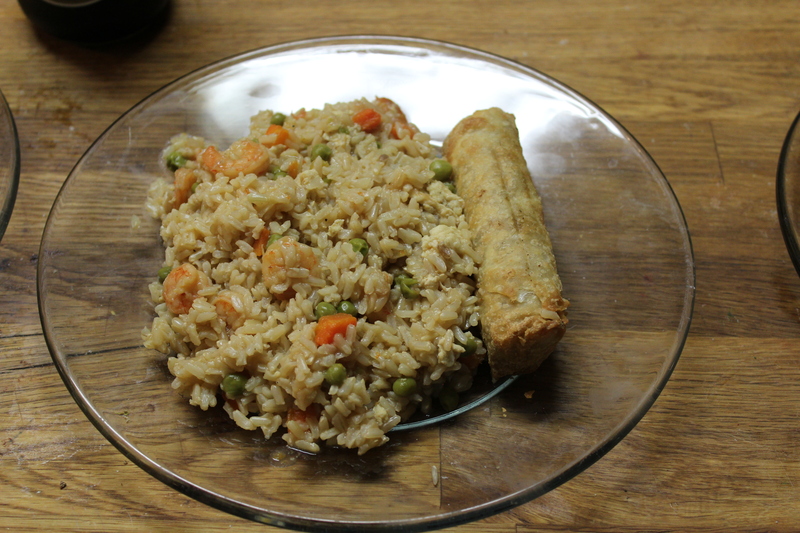 I tried to run it through additional rice cycles, no luck, everything came out mushy- the shrimp was rubbery, peas were mush. I use long grain brown rice. I have to cook on High pressure for 22 min to make brown rice. Thanks John. Can’t wait to hear how it turns out. You may want to reduce the water for Basmati rice though. Is there any nutritional information on this recipe? Thank you.